I recently sat down for a chat with Justine Ker, who was crowned Miss Louisiana in 2016 and placed in the top 15 during the 2017 Miss America Pageant. 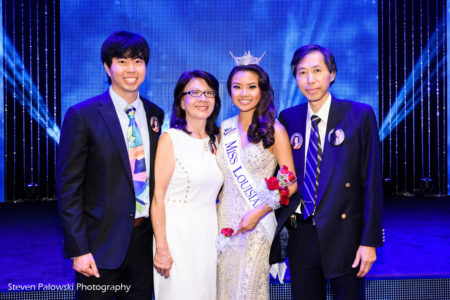 She also represents the first Taiwanese or Asian American to represent Louisiana on the national stage, a worthy accomplishment within our Taiwanese American community. Soon after she won her title, Justine and I had previously discussed trying to coordinate a sit-down interview, but our schedules didn’t coincide. A few months later, however, Justine just happened to be coming to San Francisco for a short vacation. So, this time around, we were able to coordinate our schedules and plan a meet-up to talk about some of the issues and topics of most interest to us both: her Taiwanese American heritage; her family’s experiences in the South; the challenges/successes that have helped shape who she has become; and the mental health platform she has been outspoken about. What better opportunity to learn a little more about Justine’s experiences and cultural background than meeting over some Taiwanese bubble tea–something she’s not easily able to get in Louisiana. So, after a couple of emails to TaiwaneseAmerican.org friends Andrew Chau and Bin Chen–the co-founders of Boba Guys, we were set to meet up for some hang-out time and a face-to-face interview at one of San Francisco’s finest and fanciest of bubble tea cafes. On a cloudy Spring afternoon in April, I arrived at one of the Boba Guys’ newest stores in the Hayes Valley area of San Francisco. The layout and lighting of this location would be nice for two interviews I had planned: The first would be a solo interview with Justine, and the second would include the Boba Guys themselves in discussion with both Justine and her cousin Crystal Lee, a former Miss California and 1st runner-up in Miss America 2014. Apparently, beauty, brains, and drive runs deep in their family. But, I digress. The four of them have more in common than one would think… as “cultural” representatives, entrepreneurs, and their upbringing in The South vs. West Coast. That interview will be released later this month. But, first up, Miss Louisiana, Justine Ker. Now, it’s easy for some to dismiss pageants on a superficial level, but many people don’t know that The Miss America Organization is the world’s largest competitive scholarship program for young women and one of the nation’s leading achievement programs. The Miss Louisiana Scholarship Organization is part of this program and helps young women gain poise, confidence, and life skills. After meeting Justine in person and settling in with some brief conversation, I could see why she was selected to represent the Great State of Louisiana. Well-spoken and passionate, she exemplifies an authentic quality-of-character and exudes a strong pride in her values and heritage as both a Southerner and a child of Taiwanese immigrants. Her energy and enthusiasm is contagious. Her intelligence and depth make you want to pick her brain more about her thoughts, experiences, and ideas. We conducted our interview, and although I thought I would be “digging” to get her to talk more about her cultural background, she focused right in on some of the topics that interest our audience most: identity, family, personal passions, and memories of Taiwan and its wonderful food. She is a proud 2nd generation Taiwanese American, born-and-raised in Louisiana. As a Midwesterner myself, I’ve often thought about how that minority experience and sometimes feeling like an “other” shapes our identity growing up. But, Justine is clearly comfortable in her own skin and speaks fondly of her parents’ immigrant experiences. She recognizes the challenges they faced as new immigrants to America as well as the sacrifices they made for their children–both Justine and her brother. I suspect that she’s faced some challenges of her own being one of the few Asian Americans from the small town of Choudrant, Louisiana (pop. 845), but she definitely has turned that into an advantage and taken great pride in her unique Taiwanese background by fusing it with her Southern experience. Moreover, she is inspired to use her position to bring light to issues that she finds important. During the past year, she’s been traveling the country representing the State of Louisiana promoting her platform, “A Beautiful Mind: Promoting Positive Mental Health.” Even before having a national stage to speak from, she had been a voice and advocate for positive mental health issues and strategies for coping. During college, she was actively involved with mental health outreach organizations while a student at Vanderbilt University. Now, as a graduate and as Miss Louisiana, she finds a broader purpose speaking about these issues to young children and teen audiences at schools and conferences everywhere. Justine is intelligent, talented, and accomplished. I suspect her Taiwanese American parents would have expected no less. After all, her parents’ stories are familiar ones in our community: Her dad came to the U.S. to complete his Ph.D in Industrial Engineering; her mom, just as worldly, has a Masters degree from Osaka University. Justine, herself, is classically trained in both piano and violin for over 16 years. For her academic accomplishments, the Miss Louisiana program recognized her with both a Women in STEM award and a Women in Medicine award–scholarship money included. Soon, she will be starting medical school at Tulane University, and no doubt, will be making even greater impact on people’s lives as a physician. Wise words, indeed. A good reminder, even for me, aged over the years. Our conversations continued on for a good hour after the interview you see on camera… so much of it about being Taiwanese American, finding Taiwanese comfort foods, and making an impact through service and medicine. Afterwards, I walked away from this casual chat knowing that I had connected with a new friend and discovered someone who knows how to represent the best of the Taiwanese American experience–even under the stage’s glaring spotlight. At 23 years old, I can only imagine the pressures Justine has faced in her life so far, but I am impressed by how well she has managed and navigated through those stressful times. Already, she has held tightly to the healthiest and most positive of those experiences, and she has taken this opportunity to serve as a role-model for others by sharing, teaching, and guiding. I can’t help but feel a certain pride for the inspiring role that she plays in our Taiwanese and Asian American communities. More young people need to see themselves represented in the mainstream, and Justine Ker is a beautiful example, mind and soul.